A 57 yo male presented with recent onset left hemi paresis sparing the face with right side hypoglossal (XII CN) palsy. Sensations intact. 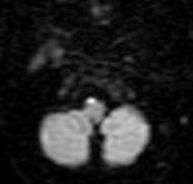 MRI Brain Diffusion shows a recent infarct with restricted diffusion involving medial portion of right half of medulla. Infarcts in medial medulla present with a classic "crossed" neurological syndrome of an ipsilateral hypoglossal nerve palsy with a contralateral hemiparesis. Medial portion of medulla is typically supplied by a branch of the anterior spinal artery which arises from the vertebral arteries. So one should look for vertebral arteries on MR Angiography to rule out any occlusion or dissection as an associated finding.